The nations largest electronics buy-back service saw nearly a twofold jump in the number of customers who locked in cash offers to sell their old iPads immediately after Apple leaked the Oct. 22 date for this years iPad introductions to a major media publication. Gazelle  a service that pays cash to customers who trade-in their old tablets, phones or computers  said iPad trade-in volume rose 86 percent this Tuesday on a week-over-week basis after AllThingsD confidently reported that Apple would be ready to introduce new models on Oct. 22. On a yearly basis, volume soared a staggering 269 percent, the firm added. This year more so than years past, consumers are embracing services like Gazelle to help them upgrade to the latest Apple hardware at a fraction of the usual cost required to purchase those new devices. That's because they're locking in high cash trade-in offers for their existing devices when new models are known to be on the horizon. For instance, consumers who act now to lock in a trade-in offer on their 16-gigabyte Wi-Fi iPad mini may be able to upgrade to a new iPad mini later this month for about half price. Gazelle says its currently buying the first-generation 16-gigabyte Wi-Fi iPad mini for $175 and expects the new model to cost $329, which means a customers should just have to pay a net cost of $154 out of pocket for their new iPad mini. Customers have a 30-day grace period from when they first lock in a price for their old gadgets to when their devices need to be in Gazelle's hands. To begin the process, customers select their existing device from the companys website and quickly assess its condition  broken, good, or flawless. 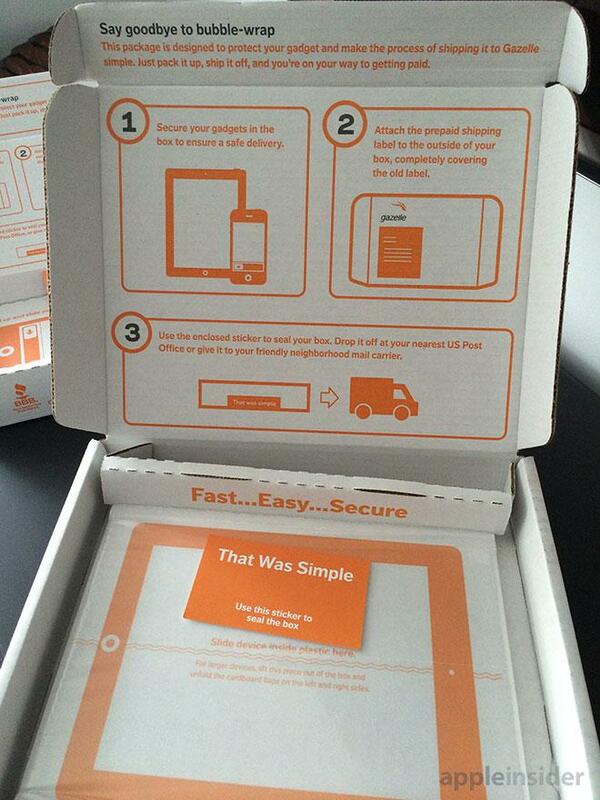 Within days, a pre-paid shipping box will show up on your doorstep. 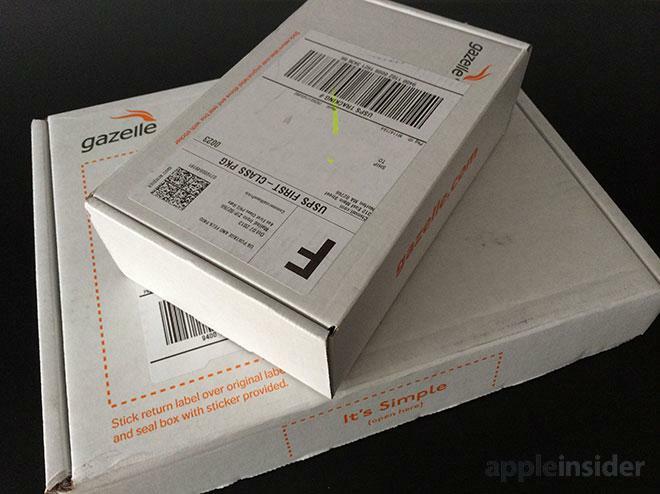 You place your old device in the box and send it off to Gazelle. Alternatively, you can choose to use your own box and simply print a pre-paid shipping label. Once your device is received, Gazelle will issue a check within 10 business days for the value of your device. You can also choose to be paid more quickly via PayPal, get an extra 5 percent by selecting your payment in the form of an Amazon Gift Card, or donate the proceeds entry to charity. As was the case with Apples recent iPhone event, Gazelle said it expects iPad payout prices to decline as the Oct. 22 iPad media event draws near. To help readers make the best of their existing hardware, AppleInsiders team is keeping track of the ever-changing iPhone and iPad cash payout prices on a regular basis its Trade-in Price Guide (iPad prices also below). Last month, Gazelle said the number of iPhone trade-ins for cash payouts leading up to  and immediately following  the iPhone 5c and iPhone 5s unveilings rose 53% compared to the same period during last September's iPhone 5 launch. When compared to the same period in 2011, trade-ins rose nearly eighteenfold.